This index page provides links to download individual sheets of the six-inch to the mile series of Ordnance Survey Maps of Ewyas Lacy published in 1887/8 from surveys conducted between 1880 and 1886. 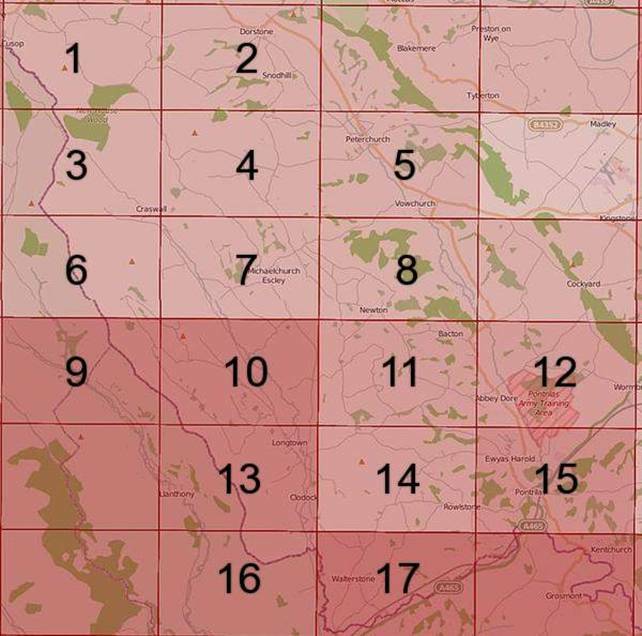 Each Ordnance Survey sheet is presented as a downloadable PDF file accessed by clicking on the links corresponding to the numbered grid squares on the overall map image of Ewyas Lacy below. Please note that file sizes are up to 5 Mb for each sheet so that the documents are of sufficient quality to permit zooming to fine levels of detail in a suitable PDF reader. The available maps cover Clodock, Cusop, Llancillo, Llanveynoe, Longtown, Michaelchurch Escley, Newton, Rowlestone, St Margarets and Walterstone in Ewyas Lacy, and parts of the Golden Valley including Abbey Dore, Vowchurch, Peterchurch and Dorstone. Ordnance Survey Map Sheets have been reconstructed from original documents held in the National Library of Scotland, based on images reproduced from their map images website with their permission. Other editions of the UK Ordnance Survey Maps up to the 1950s for Ewyas Lacy parishes are available on the National Library of Scotland website, as are sheets covering the rest of the County of Herefordshire and other Counties in the United Kingdom.